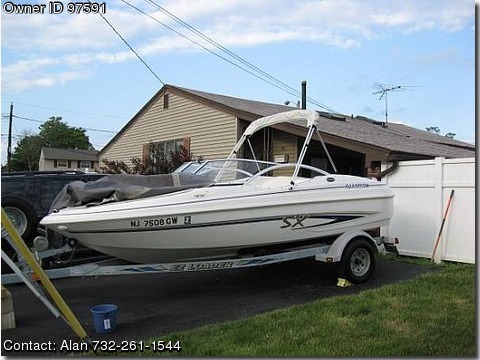 BOAT OWNER'S NOTES: Please contact the owner directly at 732-261-1544 or ahm1229491@gmail.com 2004 Glastron SX175 Runabout with Volvo Penta 3.0, 135 Horsepower I/O with less than 100 hours run time. Engine delivers great performance making the boat easy and fun to drive, Interior like new with no tears in the upholstery, Blue and white upholstery makes for a very sharp looking boat, Body is very clean, Hull is white with blue stripe, AM/FM Stereo, tilt steering wheel, gauges, fish finder, GPS, automatic bilge pump, sun deck, bimini and new canvas mooring covers, Recently installed battery cut off switch protects against forgetting to turn off any accessories, Trailer included, Boat professionally maintained throughout the year, shrink wrapped for the winter and bottom power washed and repainted every year for saltwater use, Price is $8,000 for fun in the water. Easy to tow trailer makes this boat both fun and portable, Avoid the expense of marina winter storage, just put the boat on the trailer and park it in your driveway, Easy handling and speeds of up to 37 mph allow for many enjoyable days, It opens up a world of endless adventures - swimming, fishing, tubing or just enjoying the tranquility of being on the water, Bimini allows for fun on the water without getting burnt by the sun. The price is low, the condition is great – what are you waiting for.